Despite only being one year into his contract extension with the Ottawa Senators, Dany Heatley apparently wants out. According to a report on ESPN, The 28-year old who signed a six-year, $45 million contract extension with the team in October of 2007 - that includes a no-trade clause - has informed the team of his desire to move. Senators general manager Bryan Murray has seen his club go downhill since they appeared in the Stanley Cup Final in 2007. In the 2007-08 season, the Senators had a hot-start, but then had a brutal second-half of the season and held on to seventh place in the Eastern Conference, only to get swept by the Pittsburgh Penguins. This past season, the Senators never really got it going, and missed the playoffs. In order to deal Heatley, Murray would have to find a team with the room to take on the final five seasons of Heatley's contract that would count for $7.5 million per season against the salary cap. Heatley notched 39 goals and 33 assists in 82 games last season. 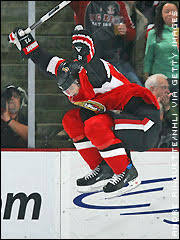 The 72 points were his lowest point totals in his four seasons with the Senators. Heatley, who had back-to-back 50 goal seasons in 2005-06 and 2006-07, is believed to be interested in going to a Western Conference team. PITTSBURGH - Dany Heatley may have played his last game in Senators uniform. Two league sources confirmed to Sun Media this morning that Heatley has informed Ottawa GM Bryan Murray he'd like to be dealt. It's believed Heatley has a rocky relationship with coach Cory Clouston and would like to be moved so that he can get more an opportunity to play. you beat me by 15 seconds! No wonder you are in the hall of fame! This is a trade that, if done properly, could turn the Senators around in a hurry. Things get a little tough and he wants out. Let him go then. I someone who wants to be on this team through thich and thin, not some primadonna who floated for most of the season anyways. You think he's the only one who wants out? The guy has an off season and still gets 40 **** goals. I would be pissed if I were glued to a dud centreman, too. A little tough? We had a losing record against the New York Islanders. We are the worst team in the NHL, and arguably the softest, and one of the teams with the most bleak horizons. He wants to be traded, fine. Just don't turn around and handcuff the Senators by using that no-movement clause to decide exactly where you want to go. Send him to NY for the first pick and take Tavares?!?! Totally. If wants to waive his no movement clause to get out then I fully expect him to waive his no movement clause. None of this list of 5 teams or whatever. LOL! I don't think they're falling for that again! Gee have him take Spezza with him and we can buy a whole new team!!! Trade him to LA for Brown and Johnson. Trade him to SJ for Cheechoo and Kaspars. Trade him Vancouver for Bieksa and Hodgson. Trade him Calgary for Regehr and Bourque. Trade him to the Avs for Stastny and someone else. Trade him to Columbus for Nash and Brassard. I don't think we're giving up enough, though. Maybe LA could throw Kopitar in as well. Hey, I'm just throwing names out there to start the trade negotiations rolling. OTTAWA — Dany Heatley could be finished with the Ottawa Senators. Senators general manager Bryan Murray confirmed Tuesday that he has spoken to the Heatley’s agents, J.P. Barry and Stacy McAlpine. Heatley has five years and $37.5 million U.S. remaining on his contract, which was signed in October, 2007. But while the contract included a no-trade clause, Heatley is apparently interested in waiving the clause. Heatley, 28, has scored 260 goals and 283 assists in in 507 NHL regular season games. In his four seasons with the Senators, he has scored 50, 50, 41 and 39 goals, playing primarily on a line with star centre Jason Spezza. But if there is no decent return, he is stuck. Sorry, but no point in a deal for a deal's sake.